I’ve just finished another quilt. This one is for a brand new baby, but not mine. It won’t even go to anyone I’ve met, and to be honest, I’m having a hard time parting with it. A little bundle for a little bundle. 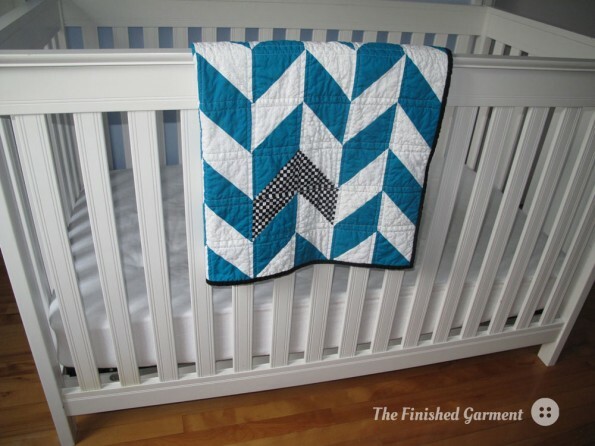 This quilt is part of the Montreal Modern Quilt Guild’s project to make baby quilts for the École Rosalie-Jetté, a secondary school welcoming teenage mothers and their babies. All of the fabric was donated, we sewed it up into quilts and the school will distribute the quilts to some deserving young mums very soon. You can read more on the project on the MMQG website. 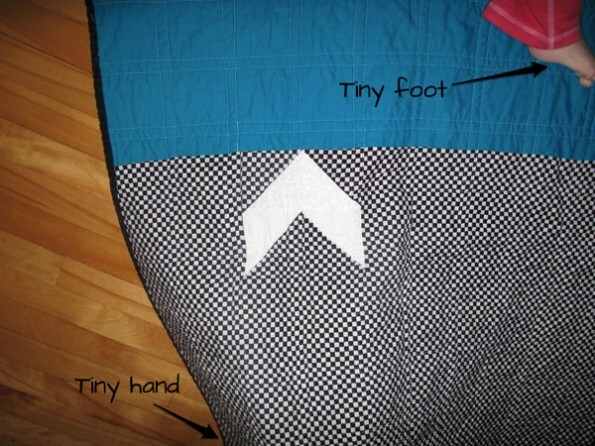 Because we made our quilts during our guild sew-ins, I can’t take all the credit. 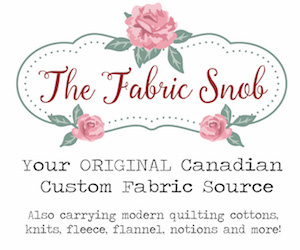 Cinzia Allocca of Deux Petites Souris did a good part of the work, including making the quilt binding – which is always my least favourite part. Thank you Cinzia! 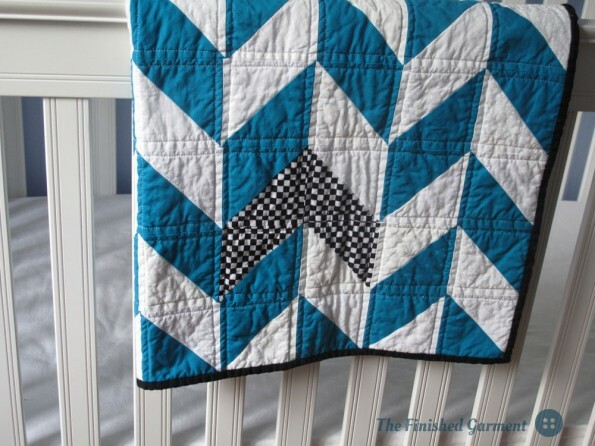 This herringbone quilt is heavily inspired by this fabulous grey herringbone quilt by Erica of Craftyblossom. But of course, since the fabric I used was donated, I didn’t have free reign, and that worked out much better than I had hoped. There is a lot more colour and contrast than my inspiration quilt, which I quite like. 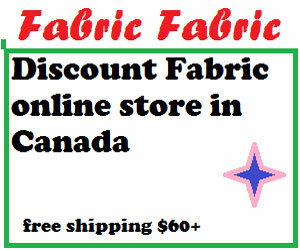 I arrived late to the sew-in where the fabric was distributed, but no one had taken the checks. How could you not want the checks, people? So fun! Again, I followed the tutorial by Red Pepper quilts on machine stitched binding. 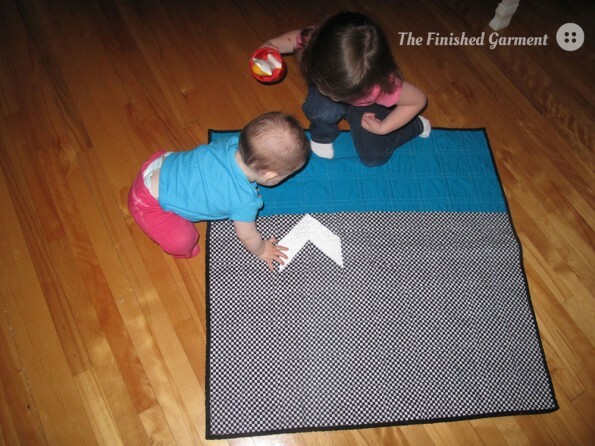 I think this is great for baby quilts because they get a lot of rough use. 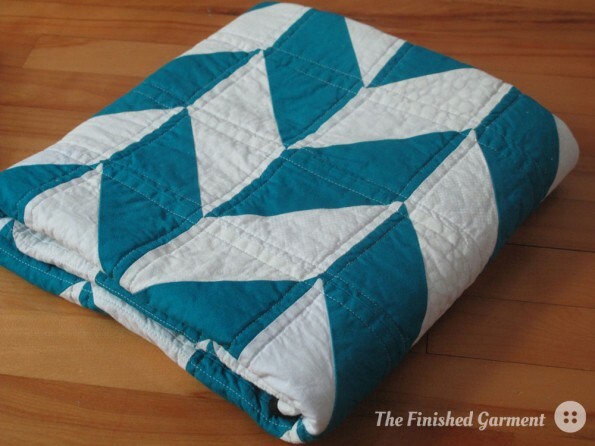 And I prefer my quilts to be well-loved. 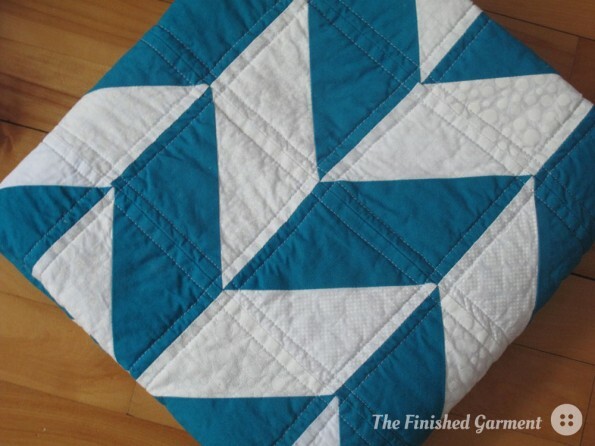 I opted for simple straight quilting. I took a lot of photos of this quilt. I had been waiting for a sunny day so I could have some good light for my photos, but luck was not on my side. It’s been rainy and grey for the past couple of days. Today was my last chance. Oh well. Looks great with the right props. I love the crinkly texture. And then, to increase the difficulty level of the photo shoot, add three small kids. All my shots kept being photobombed by tiny feet. 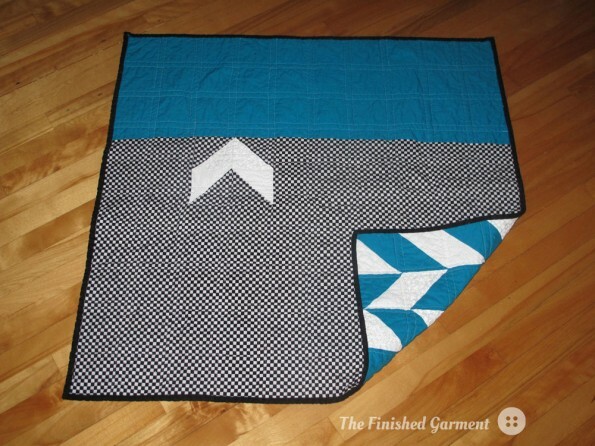 I really like how this quilt turned out and am a bit sad to let it go. Clearly, I will have to make another one that stays with me. 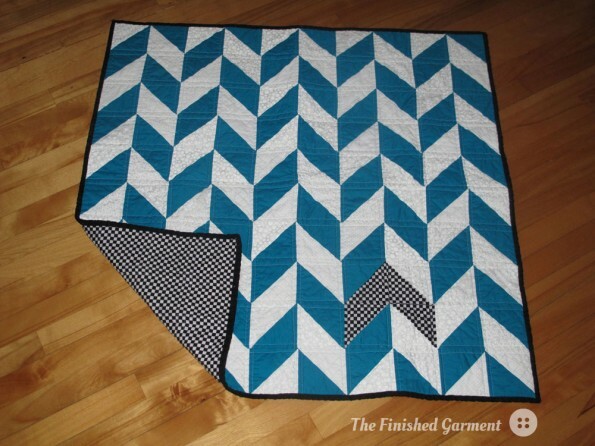 Lovely quilt, Shannon! I can see why you wouldn’t want to part with it but I’m sure it will be greatly appreciated. Lately I’ve been trying to make the backs of my quilts more interesting too and I really love the effect of the single white chevron on the back of yours! Thank you! It is definitely for a good cause and I’m glad it will be keeping somebody’s tiny baby warm and cozy. 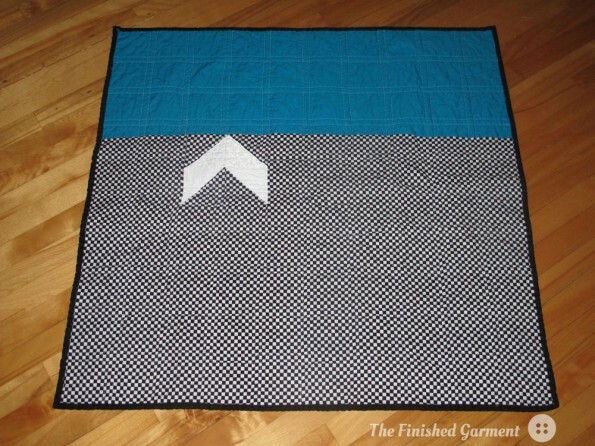 You did a great job finishing up the quilt, Shanon! Thanks for working on it! I love it! And the back is so great! love shots of your little guys! Thanks! Both for helping and for the compliments. Glad you like how it turned out. So cute – I can see why you are wanting to keep this one. Great colour! This is a beauty!!! Love all the props and the babes! Wow! 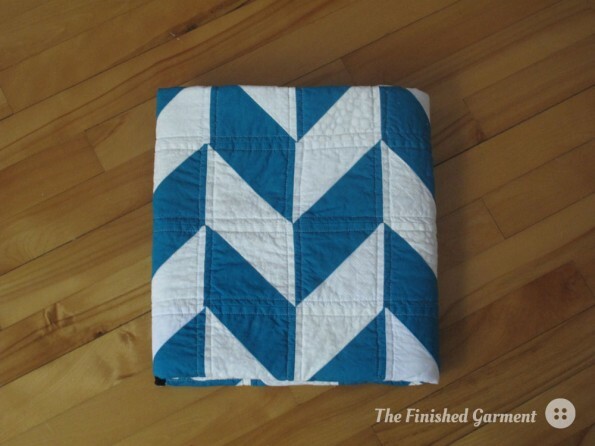 What a great way to make a chevron pattern just pop! This quilt is so modern and spunky. I love it! you’re brilliant! 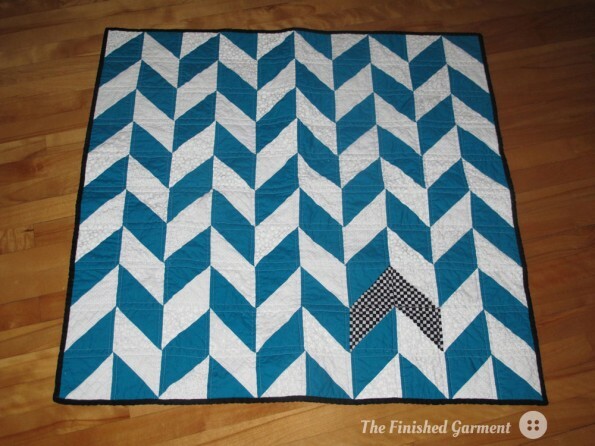 love the solo chevrons. What a great quilt. Love the touch of b/w and the back is amazing. So cool. Beautiful quilt. I think I would have a hard time letting that one go as well. I love how you switched one “v” from the front to the back, and vice versa. 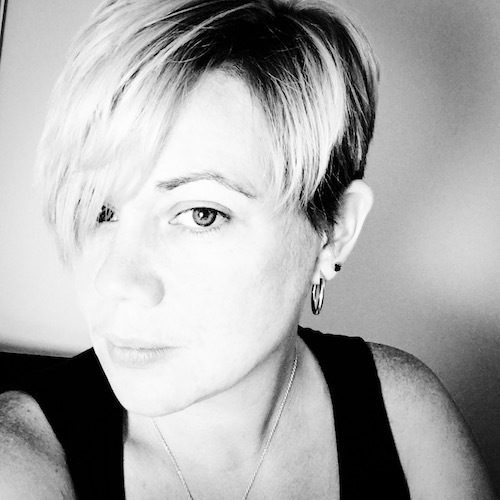 Can you tell me the size of your HSTs? I think they were 5 1/4 inch HSTs which made 4 1/4 inch squares (maybe). The fabric was donated and already cut into smaller pieces, so I just made them the maximum size that the fabric pieces allowed.